The Solar Desk Light is a kit that includes a plug in solar panel, adjustable desk lamp, and a set of cell phone battery adapters and it’s available now for only $9.99 on our new online webstore. The lamp can sit on a table or be mounted on a wall. It is ideal for any type of task lighting. 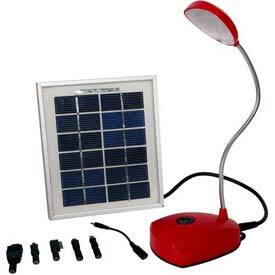 The solar panel can be unplugged from the lamp and used separately just for cell phone charging. This is a versatile two in one product that can provide lighting and cell phone charging which makes it advantageous for children and parents alike. Also, perfect to take camping!